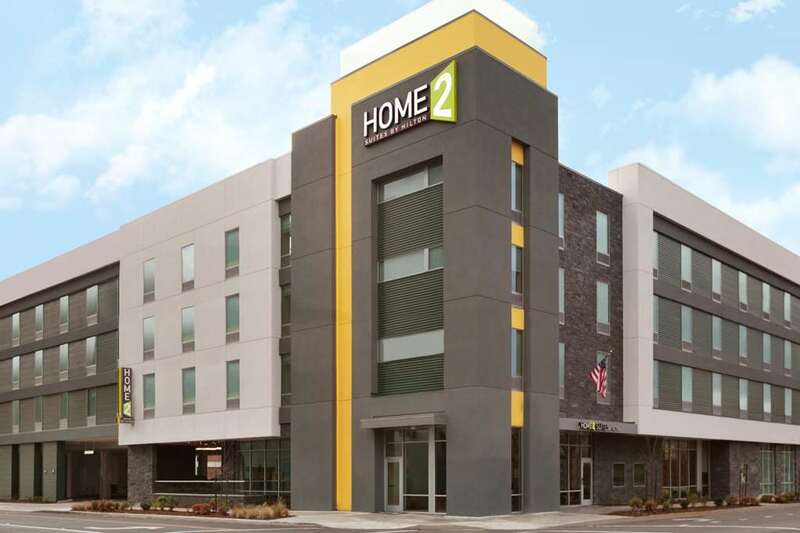 Welcome to our Home2 Suites by Hilton Eugene Downtown University Area hotel we hope you stay a while. You*ll find all the comforts of home in the heart of downtown Eugene near the University of Oregon and Lane Community College. Enjoy our ideal location to a wide array of restaurants shops and entertainment options within walking distance while the hotel puts you in easy reach of many corporations and local businesses. You*ll discover you can stay as long as you need in our contemporary spacious suites with separate living dining and sleeping areas as well as fully equipped kitchens complete with full-size refrigerators dishes dishwashers microwaves flatware and available table top induction burners. Utilize the flexible space and moveable furniture to create a customized home or office environment that is just your style. The Working Wall* allows you to stay engaged with work or home while providing extra personal storage. All of our suites feature a full-size sofa sleeper providing plenty of space for extra guests. Choose from suites with a king or two queen-sized beds. Stay active with a swim in the indoor saline pool or cozy up by the fire pit on our outdoor patio. Start your day off right around the Inspired Table for free breakfast featuring over 400 options including hot breakfast sandwiches fresh fruit coffee and juices. Make the most of your time at our Spin2 Cycle Center a combination laundry and fitness facility and stock up on snacks travel essentials beverages and microwavable meals at our 24-hour Home2 MKT. The Vintage Restaurant: Weekday lunch and dinners starting at 11am. Cozy American restaurant converted into a Crepes and pub grub. Al Taglio - New York Pizza: New York style Pizza Sandwiches and Salads. Albee*s NY Gyros: Serves Gyros and is easy to walk to. First National Taphouse: They serve locally sourced beers along with a full menu of gourmet pub fare. Makoto Japanese Restuarant: Eugene*s newest sushi restaurant. Enjoy a traditional meal of sushi and Japanese food--or if you*re feeling adventurous try one of the many unique specialty rolls and dishes. They offer food for virtually any preference ramen hearty teriyaki and teppanyaki top quality sashimi and mouth watering rolls.